My eldest daughter—burgeoning animal-rights activist and wannabe vegan (alas, she likes bacon and cheese too much to commit)—is supposed to do her first dissection soon in biology class. She is not happy about it, and after some thought, I realized I wasn’t really either: with all of the virtual tools at our disposal, do we really need to kill animals and expose our kids to harsh chemicals for 7th-grade biology? So I’m doing some prep to make a case to the school district for using a virtual program like Frogouts or McGraw Hill’s dissection tool. 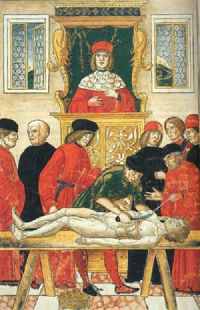 In the Renaissance, a physician named Andreas Vesalius challenged Galen’s primacy and encouraged physicians and medical students to cut into the bodies themselves. Though the idea caught like wildfire, there was a hitch: it was not easy (and often not lawful) to obtain human bodies for dissection. At different times and in different places, those wanting to dissect a human body had to obtain them from professional grave-robbers who kept the anatomists in fresh bodies. Anatomical flap books were not just a Renaissance phenomenon, however. Here’s an amazing website from Duke University Library’s exhibit, Animated Anatomies. And if that is not the coolest thing you’ve seen all day, then . . . well, you have an amazing life.